Simply onions and garlic slow cooked in butter! A "World Class Sauce" on it's own for most anything but it also makes a great base for so many other things. Dice the garlic and onions the same size. Start the butter and olive oil (I didn't show it in the video but I tend to use it because it helps to keep the butter from over cooking and adds another dimension to the sauce) in a pan over medium heat. 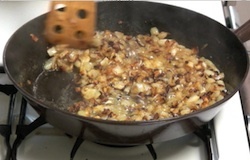 Add the garlic, then the onions. Return to the pan and stir often. Simply cook until desired doneness. I usually cook it like the picture above, a soft golden brown, but sometimes I cook it to the deep brown you see in the video. It just depends on what I'm serving them with. Which ever you choose just remember to season to taste with Rick's Chef Salt and salt if desired!